If you are reading this please share this review, page, photo, anything to help spread the word about this new brewery opening in Portland, Maine. The brewery is operated by a 22 year old brewer (Noah) and his brother (Peter), both great guys and if their final product is anything like this beer you will want it. I met up with Peter and Noah at The Thirsty Pig in Portland last week to talk beer, business and pick up a couple samples. Noah works at the bar and Peter is a photographer that took the pictures for their website. They have a solid selection of Maine beer available at The Thirst Pig including Oxbow Brewing. Back to the beer – this beer is everything I like in a beer; unfiltered, huge aroma, solid 7.3% ABV and incredible mouth feel. Noah mentioned this batch was brewed with a different hop variety than he prefers but it was still amazing. If the label on the bottle looks bad that is my fault as the samples I received were not labeled and I printed them from their website. This beer pours a bright orange with a single finger white head. Beer is cloudy with some remnants left in the bottom of the bottle. I prefer unfiltered beer so this is right up my alley. Aroma is huge and very inviting, great IPA smell. Taste has tons of hops with just enough malt to balance things out. This beer is a huge IPA from a small brewer and will quickly become a top pick of IPA lovers throughout the State of Maine. If you can get your hands on this beer you have to give it a try. This is as close to perfect as I have tasted and rated it 4.5 stars only because Noah said his preferred hop was not available. If the final product is truly better than this it will be hard to beat. Again please share this post, their website, twitter profile, etc to spread the word about this up and coming brewery. Brewers Description: What happens when you mix an unhealthy love for huge American hops, an apathy towards malt, and a long-running joke born in the Nevada desert? You get The Substance. Our interpretation of the American IPA layers Apollo, Summit, and Columbus hops on top of just enough barley to create a rhapsody of bright citrus, heavy dankness, and resinous pine, delivering a nose and flavor profile which is, in a word, unique. This beer was created by our desire to take everything good about the biggest IPAs of today, and blast those qualities into tomorrow in high gear. Be warned – The Substance assaults the nostrils the moment it’s uncapped, and pours a hazy orange that leaves a whole lot to the imagination. But don’t be scared… just enjoy the ride. Lagunitas is new to Maine and I purchased this one at Bangor Wine & Cheese last week. I had heard good things about this beer but decided to start with only one rather than an entire 6-pack and I am glad I did. This beer pours a super clear gold with slight white head. Aroma has a bit of everything with some floral, pine and citrus hops but nothing overpowering and nothing too special. Taste is fairly subdued compared to a lot of other IPAs with some hop presence but not nearly what you get from Maine Beer Company Lunch, and so many others. This was easy drinking and would compare well with some of the pale ales I have reviewed but not quite up to the standards of other big IPAs. Give it a try as you will not be disappointed but I don’t think you will find it to be anything special. Brewers Description: This is our unique version of an ancient style. A style as old as the ocean trade routes of the last centuries Great Ships. Not as old as the equator they had to cross twice enroute, nor as old as the 10,000 or so miles of Di-Hydrogen Oxide and Sodium upon which they sailed, but older than the Circulithium-4 Lentloid that binds the Lupulin Quartnate onto your taste buds. Weird. Think about it. Now stop. OK, go again, now stop. Think again, and stop. But we digress. Made with 43 different hops and 65 various malts, this redolent ale will likely float your boat, whatever planet you’re on. Thanks for your trust, and as always:Think Globally, Drink Locally!! Picked this one up on my first trip to Oak Pond Brewing in Skowhegan. They had a number of options available and because it was a hot afternoon I opted for the nice light DoorYard Ale. This beer is pretty simple but quite refreshing. Light in color with a solid white head. Aroma is minimal with a bit of bready malt. Taste starts off fairly sweet and finished with a slight hop bite. This is a beer that almost anyone could drink, even if they usually drink Miller, Bud or Coors Light. A quality brew but nothing too exciting. Brewers Description: DoorYard Ale is a light crisp ale with a smooth, clean finish. Light hopping and a hint of wheat malt blend in a mellow brew with a creamy white head. I was not sure what to expect from this beer from Founders as the prior Rye beers I have reviewed were mixed with the option from Sierra Nevada being terrible and the Maine Winnah from Penobscot Bay being quite good. Fortunately for me this one ended up being very good. Color is a nice red with single finger head that sits there throughout the entire beer leaving nice areas of lacing on the glass. Lots of aroma coming from this one with some grapefruit and pine. Smells more like an IPA than a Pale Ale. Taste mirrors the smell with a very complex mix of malts, hops and spice. Very well balanced and tastes smooth going down. This is the best of the rye beers I have had to date and one of the top options from Founders. Of course I still have a KBS to review so I am sure that will take top honors as soon as I open it. Brewers Description: Serious hop bitterness, along with an unyielding grapefruit bouquet from the Amarillo dry hop, balances the malty richness of four varieties of imported Belgian caramel malts. Pours a spectacular crimson with a creamy tan head. A generous addition of rye malt accentuates a spicy, crisp finish. Founders is a new beer in Maine and while I was able to get a Double Trouble through a beer trade this is the first time I am able to actually purchase their beer in Maine. I purchased this one at the Bier Cellar in Portland, ME and if you have not been I suggest you get their soon as Greg has a great selection of beer. This one pours a nice deep orange color with bright white 2 finger head. Aroma is fairly subtle as it is with many pale ales but there are some hops and malts in there. Taste is bitter at the beginning and then balances out with some nice sweet malts. This is a solid pale ale from Founders and something you could easily put in your fridge to enjoy with virtually any meal or share with anyone that enjoys a quality beer. Nothing spectacular but worth trying. Brewers Description: A testament to Cascade hops in a bottle, this medium-bodied pale ale has a refreshing citrus flavor and a distinctive floral hop aroma due to the aggressive addition of hops during fermentation. You’ll notice a slight malty sweetness with a balanced hop finish. Perfect to enjoy anytime, anywhere. Grabbed a single of this beer somewhere over the past month or so. Probably from Hannaford or Shaws on one of my visits for groceries. I really was not expecting much from this one being a spring seasonal pale ale. Pours a clear orange color with solid two finger head. Aroma is minimal with a bit of hops, maybe some honey (or maybe that is just my imagination due to the name and bee on the label). Taste is OK, well balanced with a sweet finish but certainly nothing special. Refreshing and OK for a warm spring day but nothing I would seek out again. Just an average beer from Long Trail. Brewers Description: Date of Introduction: 1996 / Malts: 2-Row and Crystal / Hops: Nugget and Cascade / Description: Features a medium amber body, balanced with a modest amount of Willamette hops. 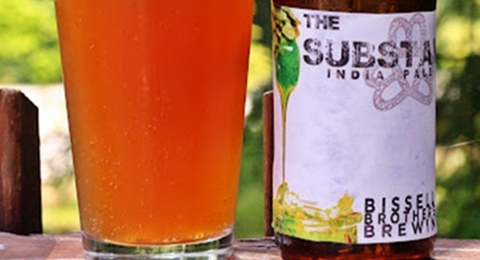 This spring ale is highly drinkable, flavorful and finishes clean and crisp. After my very poor choice with the Hopnotic IPA in the prior post I needed to find something good so I turned to Smuttynose. Some brewers simply brew great beer and you know going in the beer will be a good representation of the style, using quality ingredients and be consistently good. Smuttynose is one of those breweries. The Big A IPA is their double/imperial IPA and it does not disappoint. Great orange color with thin white head. Lots of grapefruit in the smell with some malt sweetness as well. Taste is excellent with more grapefruit and citrus hops well balanced with some sweet caramel malts. I had no idea this was a 9.7% ABV beer until I went to their website to grab the data for the blog, no alcohol taste or burn. A very good beer and easier to find than many of the rare big IPAs. Brewers Description: Ever since Stash Wojciechowski, the “Killer Kielbasa,” created this Imperial IPA for our Big Beer Series, Big A IPA has gotten a lot of attention. Lauded by the New York Times and Men’s Journal Magazine, it’s been one of the most talked-about beers around. Brewed in very small quantities, it has also been one of the hardest-to-find. Until now. Big A IPA has everything you’d want in an India Pale Ale, only more: more hops, more malt & more flavor. Na zdrowie! Nothing good to say about this beer as it was only the second beer in the 258 I have reviewed that I did not finish. I love IPAs but this one was off in almost every way. Appearance is the only part of this beer that is a positive and even that did not last long as the head dissipated very quickly and left almost no lacing on the glass. Aroma was terrible with lots of wheat and no hops. I have not had a Miller Lite in at least 10 years but this is what I remember it tasting like. Flavorless and bitter in a bad way. I gave this one a chance letting it warm slightly and the taste was still horrible so it went down the drain. Brewers Description: No mere beverage could satisfy the thirst of the gallent soldiers who stood guard over the colonies of the British Empire. Their thirst could only be quenched by a full-bodied, heartyale; an ale balanced with rich flavorful Hops. Cricket Hill proudly offer this old style India Pale Ale for those who long for the time when once your duty was complete, the taste of a fine ale was reward enough for a job well done. Founders Double Trouble is one of the best beers I have reviewed to date so when I heard they were coming to Maine I was very excited. Stopped by Bier Cellar in Portland and picked up 5 different varieties of Founders beer. Being a big fan of IPAs I decided to start with the Centennial IPA. Beer pours a clear orange color with thin white head. Nice looking beer with a pleasant aroma of citrus and other hops. The taste was a bit disappointing with a lot of bitterness and not a lot else. I compare the taste ti celery, not a bad taste but something that I don’t really enjoy. This is a quality beer that is on the edge of an IPA and and Imperial/Double IPA, good but not something I would seek out again. Brewers Description: Get ready to bask in the glory of the frothy head’s floral bouquet. Relish the citrus accents from the abundance of dry hopping. This one’s sweet, yet balanced. Malty undertones shake hands with the hop character for a finish that never turns too bitter. Pliny the Elder (and Younger) are beers that I had read a lot about but didn’t think I would get a chance to try any time soon. Out of the blue a beer friend contacted me saying he had an “extra” bottle and would like to trade. Fortunately I had a beer that he wanted and we made the trade last week. Pliny the Elder has a great label letting you know you NEED to drink it fresh, do not age, etc so I was sure to enjoy at my first opportunity. This is an Imperial/Double IPA which is my favorite style of beer lately. Color is what you would expect from an IPA nice orange with a thick white head. Lots of aroma with plenty of pineapple, resin and a bit of alcohol. Very pleasant and draws you into the beer. Taste has everything you want from big IPA, lots of fruit tastes; pineapple, grapefruit and some pine bitterness. Malts are there to balance things out with a slightly sweet ending. This is one of the best Double IPAs out there and if you get the chance be sure to try it. Brewers Description: Pliny the Elder is brewed with Amarillo, Centennial, CTZ, and Simcoe hops. It is well-balanced with malt, hops, and alcohol, slightly bitter with a fresh hop aroma of floral, citrus, and pine. Best enjoyed FRESH! That is why we make it in such limited supply. Actual bottling date is printed on each bottle! Where did we come up with this name? Back in the year 2000, our friend, Vic Kralj, who owns the Bistro in Hayward, California, decided to have his first ever Double IPA festival. Vic invited 10 breweries, 6 of whom (including us) had to brew something special for him since we had nothing that would fall under this style category. Vinnie had made a Double IPA at Blind Pig in 1994, but was not brewing one at Russian River Brewing at the time. He had an idea for the recipe, but not a name. After much research in beer books, brainstorming, and deliberation, we came up with “Pliny the Elder”. Pliny, the man, lived in the first century- 23 to 79 A.D. According to our brewing references, he and his contemporaries either created the botanical name or at least wrote about Lupus Salictarius, or hops, currently known as Humulus Lupulus. That was a very early reference to an important part of any Double IPA! Pliny the beer has now become one of our flagship brews! Pliny the Elder was immortalized by his nephew, Pliny the Younger, who wrote about his uncle succumbing to ash and smoke during the eruption of Mt. Vesuvius in 79 A.D. while rescuing people. Cheers to the scholar, historian, officer, writer, and Roman Naturalist- Pliny the Elder!